Converging digital experiences continue to drive incremental sales, according to the 3rd annual Deloitte study. The 3rd annual digital experience study by analysts at Deloitte revealed a continuing trend, showing how mobile connectivity influences retail purchasing decisions. The study examined over 3,000 U.S. consumers to understand how their digital interactions (eCommerce, social, review sites, etc) are influencing in-store U.S. retail purchases. To nobody’s surprise, this year’s data clearly shows that digital influence continues to accelerate and shift the ground under the feet of retailers large and small alike. The Deloitte study also pointed out that retailers are “dramatically underestimating the influence of digital, and are caught in a divide where they are making digital investments.” Buyers’ digital experience is becoming increasingly important. Rather than view eCommerce and physical retail separately, retailers must understand how digital experience influences multiple channels. As the rapid convergence of eCommerce and “brick-and-mortar business” continues, there are some practical ways you can create a more desirable digital experience for your customer. The good news is, many changes aren’t costly at all, it’s just a matter of making a slight shift in your business approach. Add a live chat to your site, and have your on-site personnel operate it. There are several free and very low-cost solutions available, to get the same “voice” coming from multiple buying channels. Keep it personalized. Sync your data at the retail counter (POS) to your digital data (mobile apps, eCommerce, etc). Keep their history readily accessible too, and show your prospects you know them and care about them, wherever they go. Tie-in your customer (and employee) incentives and sales promotions with Facebook, Twitter, Pinterest and/or other social networks. Your customers are there, you should be too, connecting their virtual and reality worlds, seamlessly. The customer journey doesn’t end with the sale. For customer support and service, unify your after-sales digital experience with consistent business rules, language, and a multi-channel followup process (eMail, Slack, Twitter, Facebook, phone, direct mail, etc). By the way, a recent study by NM Incite found that nearly one half of all social media users actively seek customer service through social media sites. Make sure your branding is consistent, across all marketing and sales channels. Your customer needs consistency to build trust, so make sure your eCommerce site’s buying experience, pricing, visuals and narrative are consistent with your live presence. W ant some eCommerce factoids to tweet? Shoppers are 29% more likely to make a purchase the same day when they use social media prior to, or during their trip. Nearly 1 in 3 shoppers say they spend more when they use digital as part of their shopping process. Consumers who use social media while shopping are 4x more likely to spend more. 67% of consumers read product reviews during their path to in-store purchase. 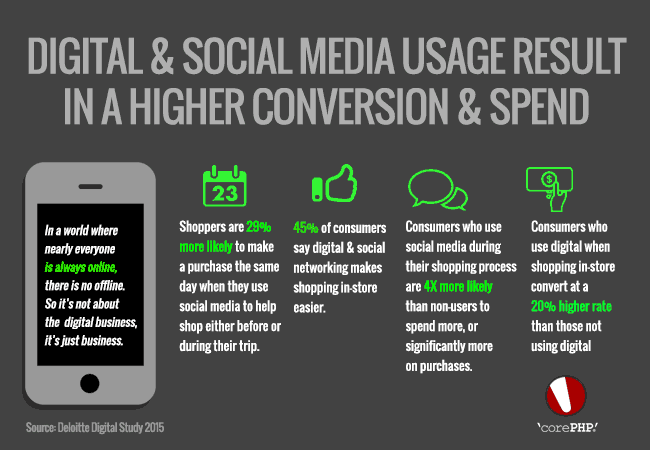 Consumers that use digital in-store convert at a 20% higher rate than those who don’t. This entry was posted in Digital Experience, E-Commerce and tagged CEM, Customer Experience, CX, digital experience, DX, ecommerce on September 18, 2015 by John Coonen. Yeah it’s absolutely right. Social media and internet marketing can surely boost the retail business because it’s an era of technology.